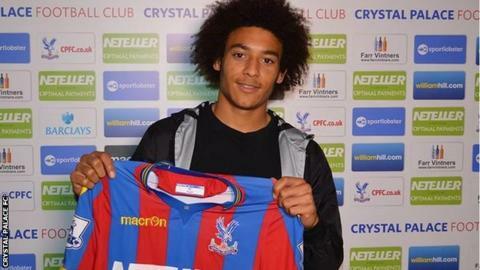 Crystal Palace manager Alan Pardew says non-league signing Keshi Anderson will be in his squad to face Leicester. Anderson, 19, joined Palace on deadline day from Barton Rovers, who play in Southern League Division One Central - seven tiers below the top flight. Pardew urged Anderson to "forget where he has come from" and how much he cost ahead of a possible debut. He said: "Keshi's now a Palace player and he'll be classed the same as Jordon Mutch, who has cost £4.5m." Anderson secured his move to Selhurst Park after scoring a six-minute hat-trick in a trial game against Palace. "Six minutes isn't bad, is it?" said Pardew, who rose through the ranks of non-league football before he joined Palace in 1987. "It's a great opportunity for him and a similar route that I took myself, coming from non-league, so he'll have sympathetic eyes from me looking for him to progress." Harry Redknapp quit as QPR manager earlier this week, citing imminent knee replacement surgery. "I don't think he's called it a day. He's called it a day at QPR but I think he'll be very keen to come back once he's got himself up and running. "He's a fantastic football manager, had a tremendous career I think football will miss him until he returns. I wish him a very, very speedy recovery." Palace re-signed winger Wilfried Zaha from Manchester United in the the transfer window for £3m, having originally sold him to the Red Devils for £15m in January 2013. "The most important thing is to have a player that you are going to enhance and bring value to the football club and not to somebody else. "I thought it was important we secured his future here and kick-started his career. He has fabulous technical ability and he needs to bring that on a consistent basis to the first team." Palace will face Liverpool in the FA Cup fifth round. The match at Selhurst Park will bring back memories for Pardew, who scored the winner for Palace against Liverpool in a classic semi-final in 1990. "It was going to be always a kind of historic game if we play Liverpool because of the history. "There will be a lot riding on the game in terms of passion and memories and it's one that we can look forward to."